Know your applicants before you hire them. Hiring the right people depends on what you know about them. Finding out what you need to know before you hire someone is challenging, time-consuming and expensive, not to mention the legal issues. Despite our best efforts, hiring often becomes guesswork. It doesn’t have to be. Orion can help. Imagine being able to sit down with all of an applicant’s previous employers and ask any question you wanted about his other on-the-job performance and get candid, unbiased and complete answers. Would you have the information you need to make better hiring decisions? Of course. But even if this were possible, who would have the time? Certainly not your managers. Orion pre-employment surveys are as close as you can get to this kind of information. And, you can get it in minutes. Orion applicant screenings give you a quick snap-shot of someone’s work-related attitudes, attitudes that lead to on-the-job behavior, behavior that either boosts or shrinks profits. Pre-employment surveys aren’t difficult to use, are they? Not at all. 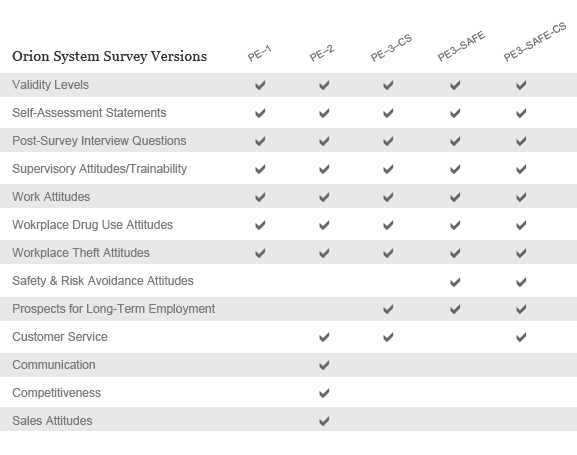 Check out the chart below to see which pre-employment assessment package has the surveys you need. The ORION SYSTEM is a pre-employment survey of applicant’s opinions concerning relevant subjects. The ORION SYSTEM is not intended, nor should it ever be used, as the sole determining factor in hiring the post-qualified applicant.